Micromat has unleashed a new version of its venerable TechTool Pro computer diagnostics and maintenance software. TechTool Pro 6 adds a number of diagnostic features for repairing hard drives, including solid-state drives and flash storage. Most notable among the changes in Version 6 is TechTool Pro’s ability to create an emergency start-up volume on the active hard drive, thanks to Micromat’s eDrive technology. With this feature, most users will no longer need to run a boot DVD or burn an eDrive on a secondary source when repairing the internal drive on their Mac. Users also don't need the Apple boot disk to keep the software up to date. This allows for increased speeds and quicker access to the program and its features. A Volume Cloning feature added in TechTool Pro 6 creates duplicates of volumes and disk images for faster memory archiving and allows users to quickly delete and recover corrupted data during hard drive scans. The update also adds a new local network manager that tracks local devices and displays supported devices and active services that can connect to your network. The updated software can continue to monitor devices that are no longer available on that network. TechTool Pro 6 is available for sale on Micromat’s Website. 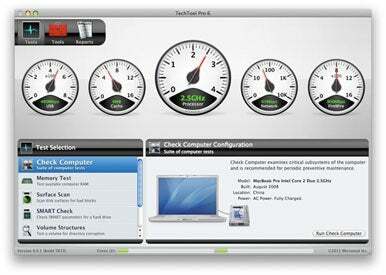 The software now ships in a family pack that lets users install TechTool Pro on up to three Macs—ideal for households with multiple computers. The new version costs $100; users of previous versions of TechTool Pro, TechTool Deluxe, and TechTool Platinum can upgrade for $40. A business pack for 10 users costs $300. TechTool Pro 6 runs on Mac OS X 10.4.9 or later, though Leopard or Snow Leopard are required for creating an eDrive on an active startup volume.